What is the right real estate investment? How do I become a successful real estate investor? How to get started renting a property? How do I make money? Do these questions come to mind? Welcome to the world of residential real estate investment. Turn your dream of being a landlord into reality! Expert advice on recognizing good and bad investment properties. Suggestions for knowing when to buys a property-and when to walk away. Tips for finding good tenants and keeping them happy-and dealing with the bad ones. A primer on the laws, rules, and rights that pertain to both you and your tenants. The co-founder of CHBO, Kimberly Smith, has written this book to support you in your rental success. Corporate Housing by Owner (CHBO) is a marketing website for corporate housing property owners and tenants interested in furnished and unfurnished short-term monthly rentals. 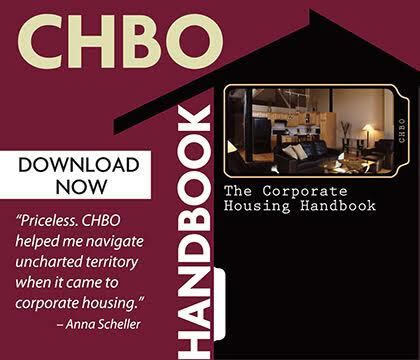 Learn more about corporate housing with the handbook, emerging trends and how to better manage your corporate housing rental. Use the links below to access the Handbook. *In order to view, you must be registered with CHBO and logged in.